I wrote about my UTG tactical messenger bag and a little bit about what’s inside of it. Now I want to write about what it’s like to carry a trauma bag around all the time for the last three months, and some tips on how to avoid attention, or at least gain favorable opinion if you do get attention. This is strictly a medical bag. I don’t put any knives, firearms, or any type of weapon inside. I don’t even put magazines or loose ammunition in, either. The reason: I always want to be able to carry my bag with me wherever I go. About ten years ago I learned not to use a range bag as a travel bag — the residue from spent ammunition and carrying firearms back and forth apparently set off some sort of sensor. I have taken this bag into several public areas where I had to submit to a search, such as sporting events. I can approach with confidence and voluntarily offer the bag up for search because I know there has never been nor will there be a threatening object in the bag. I’ve never had a law enforcement officer or security guard search more than one pocket. I normally put the bag on the front of my body, push the medical patch towards security, and open the main pocket. They usually take out the gauze pads in the main pocket, grunt, and wave me through. Putting the medical patch on the bag has proven immensely useful. Before I had it I noticed people looking at the bag and wondering what it was. I still get some looks, but they feel different. I think seeing the medical symbol helps calm people. I also hope that if I am impaired during an emergency someone will recognize the symbol and either use my kit to help me or at least get me reunited with the kit so I can help myself. As a side benefit, presenting the bag first at security checkpoints has minimized scrutiny on the rest of my person. This isn’t really about the bag, but about what I’ve put inside of it. I am getting some HALO chest seals, and at least one will go into this bag. I need to put a flashlight inside. I usually keep one flashlight on my person and at least one backup LED keychain light. I have plenty of room and flashlights are inexpensive, so I should put one in here. At one point I considered putting a utility knife inside but I wanted to steer well clear of any “weapons” policies wherever I went. The medical shears have plastic over the tips and are not very imposing. I purposefully did not put a mouth guard in this kit. CPR suggestions keep changing, and mouth to mouth is not recommended by many. I also avoided splints, band-aids, and stabilizing bandages (like a knee or ankle wrap). The kit is for trauma, not for first aid. The goal is to stabilize wounds until professionals arrive, not take care of a twisted knee or a boo-boo. One thing I wanted to avoid with my trauma kit was identifying myself as an EMT, paramedic, etc. I have a medic red cross symbol on my bag because I feel like it identifies the kit, not me. I also have my blood type on the bag. There are a few patches that other folks in the training community put on their kits that I wanted to avoid. These patches either directly or indirectly identify oneself as a medical professional. They may look cool, but a Spartan helmet or Jolly Roger pirate skull atop a Caduceus medical symbol may be misinterpreted by the unaware. I haven’t encountered any drama carrying the trauma kit in public the last three months. 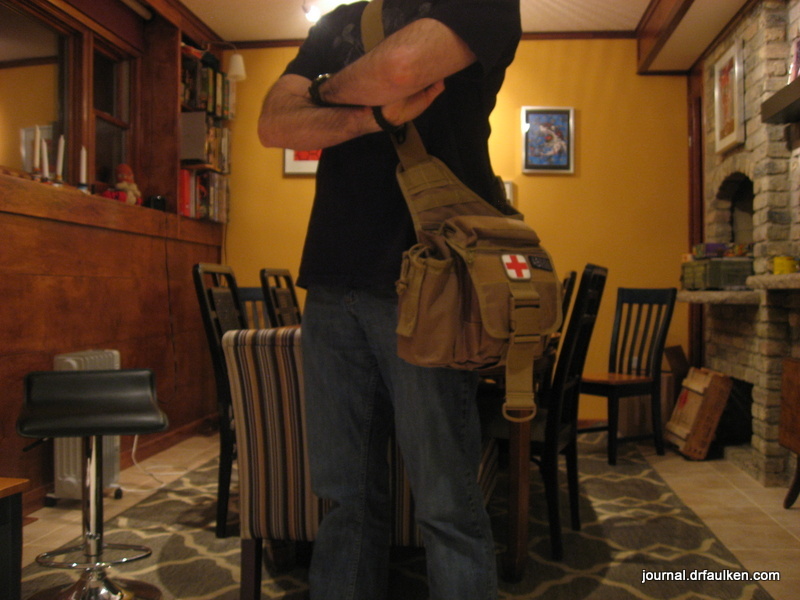 The medic badge helps public perception, and depending on your area people may already carry enough “tactical” looking bags that you blend in without it.